Do you share the same passion as Zombies do? Do you love brains as much as zombies do. I love this handbag, I wonder if it's big enough to use as a gym bag. It looks like a brain and I bet you could make heads turn if you walked into a room with it. 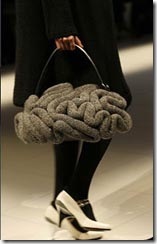 The bag was designed by Jun Takashi, It is made of wool and I wonder if someone out there could come up with a knitting pattern for a project that would rock, lol. Thanks BoingBoing for showing me this one.